The outcome of the U.S. national elections this autumn will have great bearing on the future of the Western world. Europeans especially are watching. WILL incumbent President Ronald Reagan — riding high in popularity polls — be returned to office? How strong a showing will his Democratic challenger make? Will the relationship between Congress and the occupant of the White House be improved, or, as in recent years, marked again by contention and often radically different viewpoints on key issues? Much is at stake, not just for the United States, but for the entire Western world, especially Europe. Relations between Washington and the capitals of Western Europe are strained over issues of trade and differing approaches to the Soviet Union. Many believe the Western alliance is nearing a crossroads, demanding decisive, corrective leadership on both sides of the Atlantic. Regardless of the actual outcome on the November 6 election date, political analysts are now saying that we are witnessing the end of what is called political consensus in American politics, particularly in foreign policy. Throughout the post-World War II period, little significant difference was visible between the two major political parties, the Democrats and the Republicans, in the broad range of international relations. American foreign policy hardly changed when the reigns of power were passed from Democrat Harry S. Truman to Republican Dwight D. Eisenhower in 1953. Even the changeover, eight years later, to the incoming Democrat administration of John F. Kennedy produced few ripples in the American perspective in world affairs. During this period, a president of either party could count on major support in Congress. Differences were largely confined to domestic issues, as reflected in the Kennedy "New Frontier" program. The same cannot be said of recent elections. Ever since the 1972 campaign a large gap has opened between the two parties in foreign affairs. This widening breach in the U.S. world view became apparent with the election of Jimmy Carter in 1976. Launching the country on a new post-Vietnam course of action, Mr. Carter claimed that the United States had shed its "inordinate fear" of communism. The dominant East-West rivalry was to be replaced by an attempt to close the so-called North-South economic gap. Third World regions were to be "depoliticized" in an anticipated "new global age." Hemispheric troubles — soon to erupt in Nicaragua and El Salvador — lay, said the President, "outside the context of the superpower relationship." A different signal was picked up in Moscow and Havana. They could at last capitalize on the region's social and economic problems to make significant gains of their own. In Western Europe, Mr. Carter's abrupt cancellation of the controversial but nevertheless defensive weapon, the neutron bomb, caused shock waves throughout the NATO alliance. West German Chancellor Helmut Schmidt was particularly angry, from then on criticizing the Carter administration for being indecisive and unpredictable. Sensing disarray in NATO, the Soviet Union stepped up its western defenses by the deployment of SS — 20 missiles targeted against the cities of Western Europe, upsetting the East-West balance along the most heavily armed Cold War front in the world. Mr. Carter's greatest misfortune was to be burdened with the situation in Iran in which U.S. officials were held captive in their own embassy. Negotiations proved futile. Even the attempt to rescue the hostages by military operation came to an early, dismal and fiery end on the floor of the Iranian desert. American prestige had sunk to perhaps an all-time low. Ronald Reagan came into office on January 20, 1981 — the day the Iranians released the hostages — with the avowed purpose of restoring the nation's fortunes. The nation's fiscal priorities were reset with defense allocations immediately increased. The President, a persuasive speaker, subsequently took to the television screens several times to warn the American public of the dangers in the revolutions brewing in the Western Hemisphere. The problems were fundamentally economic and social in nature, he said , but outside powers were attempting to take advantage of them, with the ultimate aim of threatening the security of the United States itself. Americans, the President said, could not afford to see the entire region from the Panama Canal to the exposed southern border of the United States in the hands of hostile forces, ruling over 100 million people. In Europe, it was felt by some that after the Carter administration experience, the governments of the NATO countries would welcome the changeover in Washington. This proved not to be entirely the case, however. European officials had adjusted to the lack of firm Washington leadership and. were not quite ready to be led again — or lectured to. Mr. Reagan's blunt talk concerning the Soviet Union disturbed many on the Continent, who were also not convinced of his clear-cut position on Central America. The generalized European reaction to the Reagan administration in turn led to charges from so-called neo-conservative circles in the United States that, if Western Europeans were to go "soft on communism," that perhaps the NATO alliance no longer stood for anything and should be radically restructured, if not scrapped altogether. The most disturbing element to outsiders concerning the American political scene today is that, from one election to the next, Washington's view of the world and its policies toward both friend and foe can now change abruptly. "There simply is no longer a main line of American foreign policy to which the two major parties adhere. This is the new reality." So writes William Pfaff, an American journalist living in Paris. What is lacking, he adds, is a "popular consensus of belief on where America stands in the world and what are its aims." The result, he continues, is what Secretary of State George Shultz has complained of: "light-switch diplomacy" — policies turned on and off according to whatever philosophy and political outlook is in vogue in Washington at the time. Light-switch diplomacy, Mr. Pfaff asserts, " is exactly what American diplomacy is likely to remain for the foreseeable future." The prospects of future wild swings — if not in 1984, very possibly 1988 — in U.S. foreign policy are already evident. But should the Democratic Party prevail in the Presidential election in 1984, writes columnist Patrick J. Buchanan, "the most radical shift in America's direction and national priorities will be in foreign policy and national defense. The fundamental premise of U.S. foreign policy for 40 years from Truman to Reagan [the East-West struggle] ...will be abandoned." One indication of this is the position taken in foreign policy by Democratic challenger Jesse Jackson, who is having an impact upon his party's future directions. Mr. Jackson sees the world through dramatically different lenses than President Reagan. He has made repeated references to America's "obsession with communism," expanding upon the theme of the Carter administration, but carrying it much further. He has criticized the "Europe-centric" attitude he claims most U.S. politicians have had, and refers to himself as having grown up as a "Third World resident in the First World." Former U.S. Secretary of State Henry Kissinger expressed his own deep concerns over what he called the "crisis of confidence" in American leadership. "I think we are almost approaching Argentine conditions in foreign policy," he said, referring to that nation's notorious deep social and political divisions. The United States, he added, is beginning to look "incapable of mastering events. And then the question is, 'Who will emerge, a serious leader or a demagogue?'" Reminded that he had warned against any more "debacles" in foreign affairs, he responded, "But we're headed for more." A "determined American policy," he added, could still remedy the slipping situation — " if there was one." "Huge and powerful still, but purposeless and ineffectual, the United States lies wallowing, like some dismasted man-of-war, in the trough of world events." Growing U.S. unpredictability in foreign relations is playing a big role in the surging "Europessimism" on the Continent. Simply expressed, Europessimism is a widespread feeling that the nations of Europe are henceforth consigned to a largely irrelevant backwater, especially in the world economic order. For example, the high-tech race, it is believed, has largely been lost to Japan and the United States. "This American presidential year has shown that Americans are growing impatient with the anomaly [of spending so much money to defend Europe]. They will grow more impatient, as economic opportunities in the Pacific and political alarms in Central America turn their eyes westward and southward away from Europe." The late spring decision on the part of the government of the Netherlands to delay by two years the acceptance of new NATO cruise missiles for deployment on Dutch soil adds to U.S. impatient concern over the reliability of European nations in the alliance. The Dutch decision plays directly into the hands of conservative NATO reformists in the United States who claim it is further proof that the Europeans simply are not willing to hold up their end of the alliance — so why should the United States be a part of the alliance any longer? The European head-of-state most publicly concerned over these developments is France's President Francois Mitterrand. He has proposed that an old institution, the Western European Union, should be revived, composed of Britain, France, West Germany, Belgium, Holland, Italy and Luxembourg. As a first step, he sees the WEU serving to eliminate duplication in the European arms industry. Further ahead, it could actually develop into a European military command. President Mitterrand is also attempting to translate Europessimistic anxiety into political action. In a vigorous statement of confidence in Europe's future, Mr. Mitterrand declared May 24 in Strasbourg, France, that his country is ready for formal discussions on a new treaty of European political unity. Addressing a session of the 10-nation European Parliament, Mr. Mitterrand warned: "We are again in a phase when destiny is in the balance. For too long we have been held back by absurd quarrels." To move the unity issue off dead center, Mr. Mitterrand proposed "preparatory conversations" leading to a "conference of interested parties" on a new political treaty. The French president hinted that some members of the 10-nation European Community — implying Britain — may not be interested in such a political treaty. But the thrust of Mr. Mitterrand's speech was that Europe must move toward unity despite yearly complaints over the EC agricultural budget by the British. "I am too confident of our history to allow that we could decline," stresses Mr. Mitterrand. "But we must not act too late." In the months and years ahead, more leaders in Europe are destined to step forth and demand the same thing that another Frenchman, historian Fernand Braudel, declared: "Unless we can revive the idea of a United States of Europe, we won't be able to rescue European culture, not to mention the European economy." And central to such unity is the development of a common defense posture — at first in close coordination with that of the United States, but gradually acquiring greater independence. In a practical demonstration of joint European defense development, the French and German governments, according to the May 28 Aviation Week and Space Technology, are expected to sign soon a joint memorandum of understanding for the development of a new antitank helicopter. The first flight of a prototype could be in 1987, and the first delivery — to the French military — could be as early as 1991. Some circles in the United States are actively encouraging such a development. 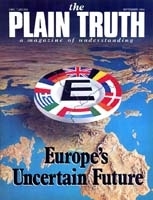 Columnist William Safire predicted that "winds of change" would eventually blow U.S. military forces home from Europe. Mr. Safire also foresees "in the coming decade" that West Germany and France will pool their military resources to form what he called "a new axis of power." Business Week magazine warns that "the Paris-Bonn axis" and other steps to strengthen autonomous European defense arrangements "tend to set Europe apart from the U.S."
Some leaders in Europe are openly thinking past current taboos into the future. For example, Juergen Todenhoefer, the chief disarmament spokesman for West German Chancellor Helmut Kohl's Christian Democratic Union, called, on April 17, for a greater role for Europe in its own nuclear defense, and, eventually, a West German voice in the use of nuclear weapons. Todenhoefer's remarks do not constitute official West German policy and they received considerable criticism. Nevertheless they reflect a growing West German concern for greater control by Europeans of their own defense. Thus, the potential for further wild swings in American policy from election to election and the grave uncertainty that these will produce, could have a great deal to do with the eventual emergence in Europe of the final stage of the historic revivals of the Roman system, prophesied in your Bible. It will comprise a political, economic, military — and even religious — union. If you have not already done so, read our free booklet The Book of Revelation Unveiled at Last, which explains the future in significant detail.